Don’t ignore bad reviews, use them to build credibility for your restaurant. Your first reaction will be to ignore the review and think this customer just doesn’t know what he says, or “only wants free food”. This reaction is normal, your restaurant is like your baby, and you care about the experience you provide to your customers. BUT, it’s actually a great opportunity to learn and get new people to try out your food! You have to show that you care about your clients by being reactive. Your reaction has to be made really fast: in a day or two if you can’t before. The mistake could have been made during a delivery, on the website or in your restaurant itself. Whatever the subject of the bad review, it’s there for a reason. In life, each reaction is subjective, and the hardest part is to be able to put yourself in somebody else’s shoes. It seems obvious but a lot of restaurants forget to do an elementary thing: just apologize. Saying you’re sorry is not a weakness but instead, it shows that you’re able to admit you made a mistake (subjectively speaking) and you’ll doing your best to fix it. A fault confessed is half redressed But don’t fall in a trap: don’t say it won’t happen again nor apologize for everything, remember it’s all subjective. Just explain that you’ll do your best and invite the client to come back. You could even try to give him a coupon or offer drinks if he does. As long as you show your presence on social networks, you give yourself credibility by answering critics. People will see you are open minded, and will think you learnt from it, that now they are sage and that you’ll do a good job. After these two steps, one other way to create a dialog and collect feedback is using social networks. Twitter might be the easiest for you. By doing so, you engage with your customers and you make yourself accessible. It’s a great opportunity to show you care about their satisfaction and that there is a real person behind your brand. Why not trying humor? It’s a different way to communicate with customers and make them adopt your brand faster. But be careful, if this doesn’t work, you can discredit your brand, and would be very hard to be backing off. Social network are places where entertainment is essential, you can be friendly and offer a bit of fun. In France, SNCF (the national company of trains) made a stroke of genius, the responded with humor to whom was unkind or insulting. @Julie_Voisin: The rational for SNCF: the more the queue is big, the more they close ticket office. @SNCFinfo: Good evening @Julie_Voisin, is our queue as big as the distance between your eyebrows? @Cocayne_: F***er !! f*ck your big sister! F*ck SNCF you smell like death you bunch of idiots. @SNCFinfo: Good evening @Cocayne_, we’re sorry a train didn’t roll over you yet. Even if sometimes our nerves are challenged in an extreme way, when you are ambassador of a brand, you have to stay calm: you are the brand. So, first step: don’t be aggressive! Except if you want to have bad reviews again and again. Write clearly, and don’t answer right after you read a bad review, give time to yourself to breath and think wisely about what you will write. The worst mistake you could do is act like nothing happened. You have to pay attention in every word people say about your restaurant, or brand. 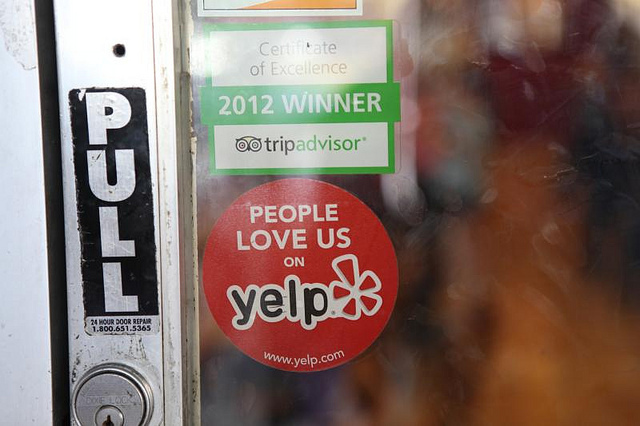 Contrarily to what one might think, bad reviews are a chance for a restaurant. On the web, people feel anonymous, so they say what they really think. You know exactly what they think of you Home Page. Thanks to them, you can improve your services until you’re the best. The most important thing to do: increase efficacy and satisfy customers. Your own clients are great communication vectors, don’t underestimate them. If they like your brand and feel close to it, they are the best communication you could ever pay for. Even unhappy customers can be transformed into loyal customers. If a competitor attacks you, they could be your watchdog, they defend places they like and they are the one with the most credibility. You have to make things easier for them. First, let them order online. You have plenty of solutions well design for your restaurants. Keep in mind people hate to create an account to order food. If you can avoid this pain, you’ll get more orders. Then, in the delivery process: don’t be late, and keep your customers aware about their orders. There is nothing more frustrating that being stuck at home and waiting for a delivery. You now have diverse solution like this delivery software and real-time tracking solution. At the other hand, you can provide a good delivery experience: try to be creative and offer something new (goodies, funny outfits, a speech to declare in every delivery). In sum, a story telling around your brand: tell a story people can memorize and repeat to others to increase your notoriety and reach. Customise their experience and get more love from your customers who will remember your brand! Give them the opportunity to talk about you the right way instead of the wrong way and differentiate yourself from your competition!